Onlinecanadianpharmacy.com is operating from Canada and is a “US-accredited Canadian Pharmacy Intermediary”, as the website information puts it. 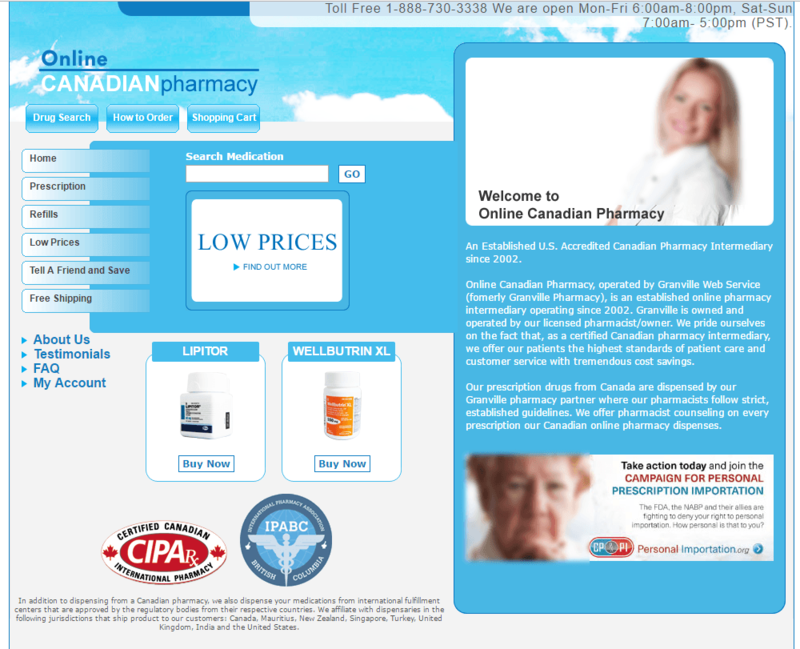 The website, Onlinecanadianpharmacy.com operates since 2002 and is owned by Granville Web Service (or previously Granville Pharmacy). As an intermediary, Onlinecanadianpharmacy.com functions to provide its clients the best online prices for the prescriptions they need. The store, Onlinecanadianpharmacy.com, is a member of CIPA or Canadian International Pharmacy Association (I actually verified the site and it’s true), and also a member of IPABC or International Pharmacy Association British Columbia. Unlike the common internet drugstores, there is no extensive list of meds on Onlinecanadianpharmacy.com, but it has a search function for the available medications. Like almost all internet pharmacies, Onlinecanadianpharmacy.com has Viagra (Pfizer) containing Sildenafil Citrate available, and the price for the 100 mg variant costs $54.45 for 4 tablets. Onlinecanadianpharmacy.com also has Cialis by Eli Lilly (Tadalafil) and has the product for $70.29 for 4 tablets. These prices are not the best prices, though, as there are stores with lower price options for the products. Onlinecanadianpharmacy.com accepts payments from credit cards. It is weird but Onlinecanadianpharmacy.com does not ship its products to Canada. The store does not also cater to international orders, so I am assuming that the store is shipping only to US locations. According to the store, new orders are free to ship, but older clients are charged with the minimum fee of $9.95. Users have to wait for 2-4 weeks for their orders to arrive, since though the site sources its products from a number of locations like Singapore, Turkey, United Kingdom, India, Canada, Mauritius, New Zealand, and lastly, the United States. The alleged reviews posted for Onlinecanadianpharmacy.com were all reflective of user satisfaction for their purchases. According to Sonia (from Los Angeles, California), she found Onlinecanadianpharmacy.com’s service “excellent” as well as its customer service and will recommend the store to her associates. Anita, from El Dorado, Arkansas, also thanked Onlinecanadianpharmacy.com for making “her life better”. She also thanked the store for sending her Christmas cards and appreciated the fact that no online store did that to her, ever. 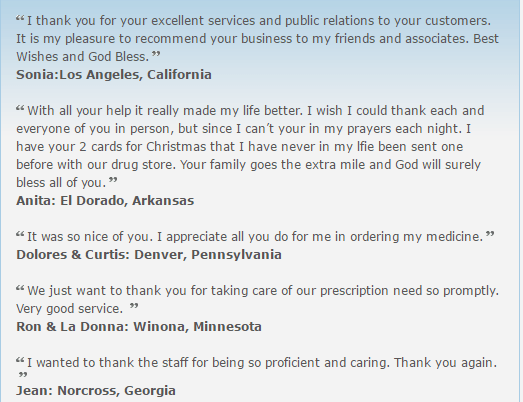 The other reviews from Dolores and Curtis (Pennsylvania), Ron and La Donna (Minnesota), and Jean (Georgia) were all thankful for Onlinecanadianpharmacy.com’s service. Some of them also mentioned about the care given to them by the store, which transcended professional service. However, as much as these reviews are heartwarming, these are all from the website’s own, so there is a large chance that these reviews were untrue and may not be good to rely on 100%. Scamadviser.com determined that Onlinecanadianpharmacy.com had a lot of views in the past years, but only gave the store a 56% safe rating. According to the more detailed report, Onlinecanadianpharmacy.com is a website operating for almost 15 years and is currently concealing its real location, although it might indeed be located in Canada. Onlinecanadianpharmacy.com was also included in the stores which are “threat listed” and it is due to malware reports available for the website. If Scamadviser.com gave Onlinecanadianpharmacy.com a 56% safety rating, Scamner.com gave the website 0% out of 100. 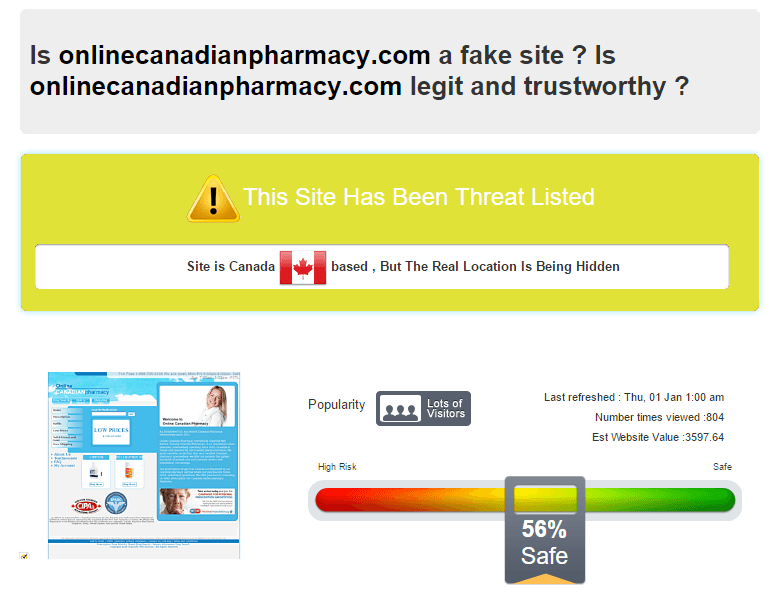 Although it is good that Google has not already reported the site as unsafe yet, there had been several reports for Onlinecanadianpharmacy.com being an online scam and Scamner.com advises that users avoid this site. Also, Onlinecanadianpharmacy.com does not own an SSL certificate, which means buying from the store is not secure and might compromise your details. Based on the information on Onlinecanadianpharmacy.com, it is granting free shipping for all its new customers. No charges for shipping will be charged for all new orders on the website. Nevertheless, there were no old consumer loyalty rewards or discounts for repeat buyers on the website, which would have helped for Onlinecanadianpharmacy.com to maintain its clients. Onlinecanadianpharmacy.com had a simple demeanor which may give a hint on its age as an online pharmacy. There were no impressive graphics, and I can say that the site is a bit direct when it comes to its design. The prices are on the average side, not too low or too high; but since there are other pharmacies with lower prices and with good deals for the meds, buyers may not be able to patronize this site much. Since there were no reviews aside from the positive comments posted on the website itself, I can’t say that Onlinecanadianpharmacy.com is a reliable site to order from. The available analysis results for Onlinecanadianpharmacy.com were not also good; Scamadviser.com awarded the site with a “threat listed” status. These ratings led me to give Onlinecanadianpharmacy.com 2 out of 5 and not endorse it to interested clients. For erectile dysfunction meds, there are better price options available on the web.